Pierre-Auguste Renoir (1841–1919), Strawberries (c 1905), oil on canvas, 28 x 46 cm, Musée de l'Orangerie, Paris. Wikimedia Commons. Like the sense of smell, taste is one of our more ‘primitive’ senses, and linked to basic biological drives such as hunger and preparations for eating. As Pavlov so memorably demonstrated, mammalian behaviour can be conditioned so that we anticipate the act of eating by making saliva and gastric secretions, although hopefully none of us sits and drools whenever a bell is rung. Those of us who live very ordered lives, such as monks and nuns who gather in a communal eating area such as a refectory, where they are exposed to specific paintings and other visual stimuli, could perhaps come to associate those paintings with the act of eating. For most of us, though, paintings are likely to struggle to evoke particular tastes, although they could more readily elicit a desire for food, even salivation, perhaps. José de Ribera (1591–1652), Taste (c 1616), oil on canvas, 113.5 × 87.5 cm, Wadsworth Atheneum, Hartford, CT. Wikimedia Commons. 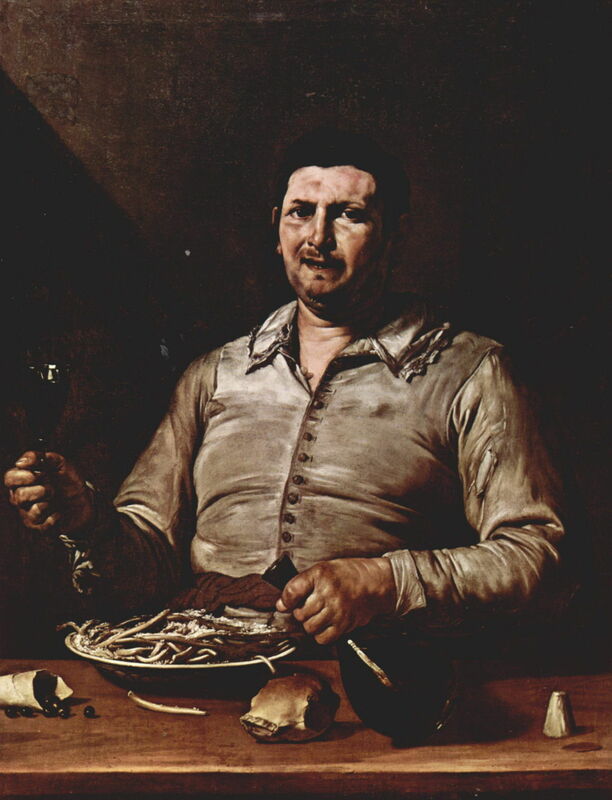 José de Ribera’s early painting of Taste from about 1616 shows a man, a decanter in his left hand and a goblet in the right, who has just polished off a large bowl of food. The small skull in the foreground and the abundant cleaned ribs suggest that this might have been a rabbit pie or similar – by modern standards neither particularly tasty nor appetising. Jan Brueghel the Elder (1568–1625) and Peter Paul Rubens (1577–1640), Taste (Allegory of Taste) (1618), oil on panel, 64 × 109 cm, Museo Nacional del Prado, Madrid. Wikimedia Commons. Jan Brueghel the Elder’s Taste (or Allegory of Taste) (1618), with figures painted by Rubens, is an almost exhaustive catalogue of what was then considered to be edible. At its centre, Pan (or a satyr) pours a woman with an ample figure a coupe from his large flagon. Immediately in front of her are a dozen oysters, and the remainder of the table is packed tight with an array of exotic dishes. 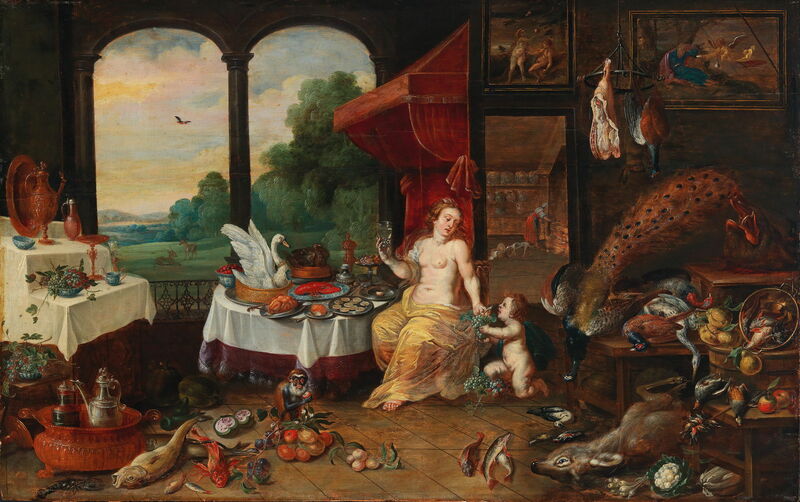 The rest of the room – which opens out to a deer park and distant palace – is piled with unprepared foodstuffs, including a boar’s head, peacocks and many game birds, a hare, rabbit, fish, shellfish, fruit, and vegetables. In the left distance is a kitchen in which food is being prepared. In keeping with the theme, paintings on display show the marriage feast at Cana, The Fat Kitchen, and a festoon of fruit. This demonstrates how our taste and eating habits have changed in the last four centuries. Delicacies which were restricted to nobility, such as Swan Pie, would today make most of us go for the vegetarian option, and much of our food we only see following extensive preparation and processing. Instead of inspiring our hunger, most of us would now see Brueghel’s magnificent painting as a celebration of excess almost to the point of obscenity. Abraham Janssens (1567–1632) (circle of), The Sense of Taste (date not known), oil on canvas, 114 x 94 cm, location not known. Wikimedia Commons. An artist in the circle of Abraham Janssens probably painted this more modest The Sense of Taste at about the same time, around 1620. The fare shown appears to be a simple pie, but alongside it is what looks like the cooked head of a bird. The woman holds aloft an ornate goblet of what seems to be plain water, which together with the bread on the table is the most basic of meals. The man is still wearing his hat, which looks decidedly odd. Johann Daniel Glöckler (?1596-1650), Allegory of the Sense of Taste (1621), oil on panel, dimensions not known, Muzeum Narodowe we Wrocławiu, Wrocław, Poland. Wikimedia Commons. 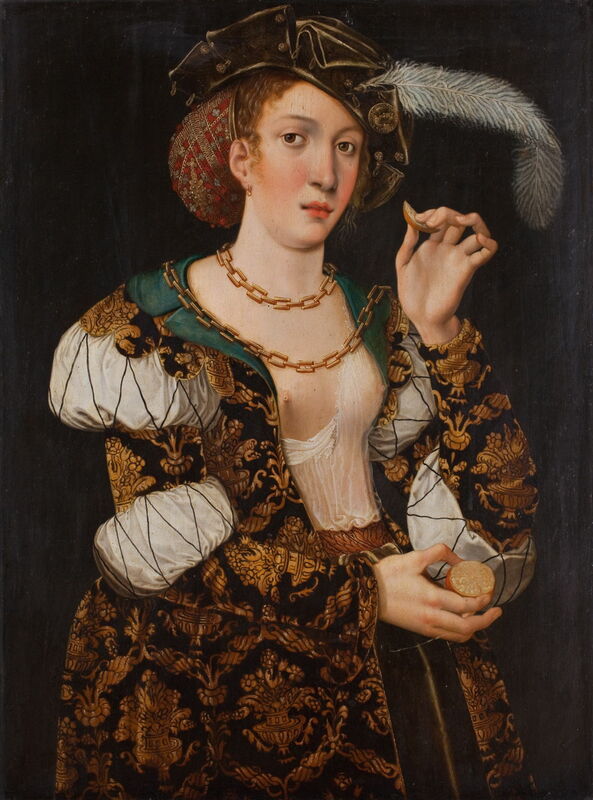 Johann Daniel Glöckler’s Allegory of the Sense of Taste (1621) shows a very demure woman, apart from the completely incongruous exposure of her right breast, eating a thin segment of what may be an apple or an older fruit such as a quince. Although a marvellous work, it does little for me in terms of taste or salivation. 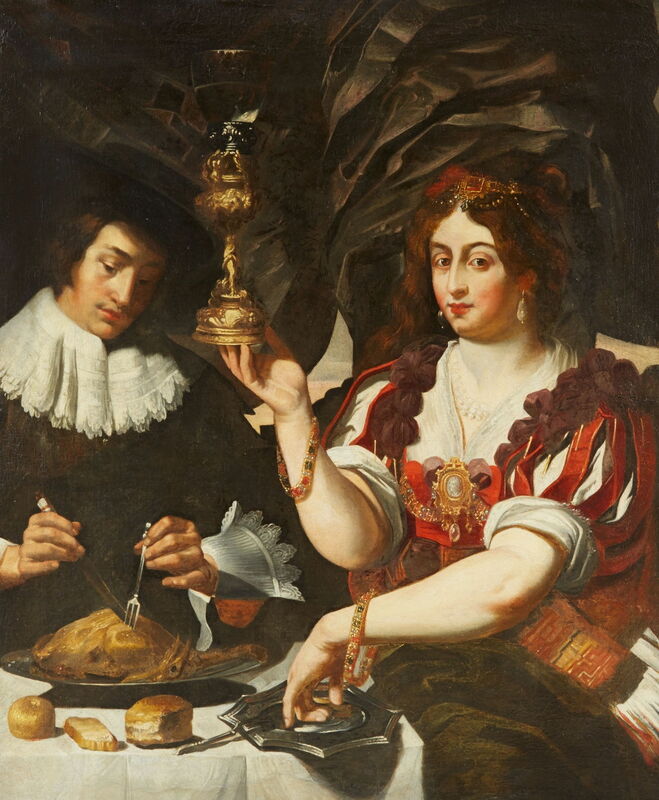 Frans Wouters (1612–1659), Allegory of Taste (1635–59), oil on panel, 56.5 × 89.2 cm, location not known. Wikimedia Commons. 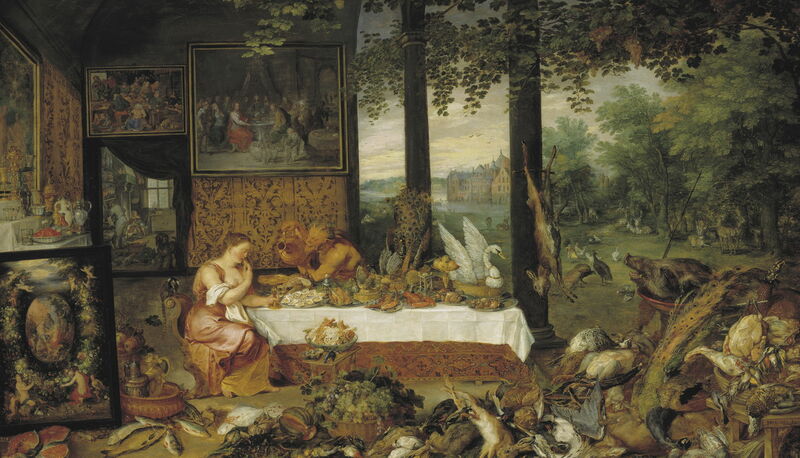 Frans Wouters’ Allegory of Taste followed in 1635–59, and was clearly inspired by Brueghel. 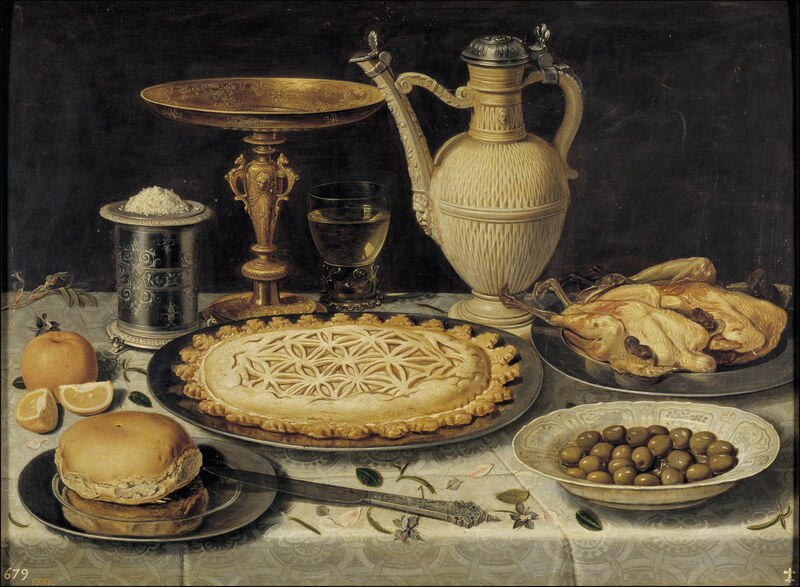 Instead of the lavish jam-packed collation in the earlier painting, Wouters seems to have had a smaller budget, or perhaps wished to avoid the sin of gluttony. Its emphasis, though, remains on unprepared foods, including a range of game animals and birds, fish, and fruit. There is still the famous Swan Pie on the table, but there is no sign of Pan or his aphrodisiac oysters. David Rijckaert (III) (1612–1661), Peasant Woman with a Cat (1640-42), oil on canvas, 35 x 28 cm, Hermitage Museum Государственный Эрмитаж, Saint Petersburg, Russia. Wikimedia Commons. 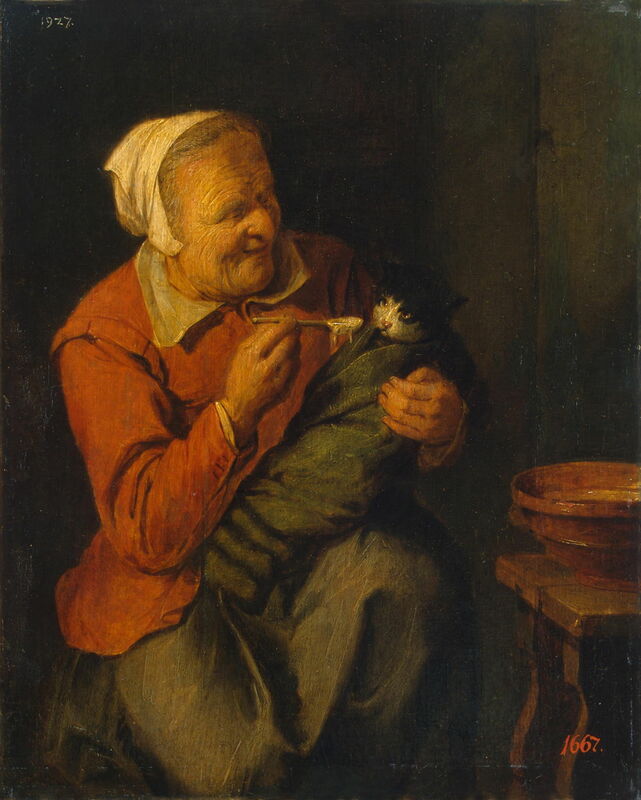 More humorous is David Rijckaert’s Peasant Woman with a Cat (1640-42), showing an elderly woman spoon-feeding porridge to a tight-swaddled kitten. Philip Mercier (c 1689-1760), The Sense of Taste (1744-47), oil on canvas, 132.1 x 153.7 , Yale Center for British Art, New Haven, CT. Wikimedia Commons. 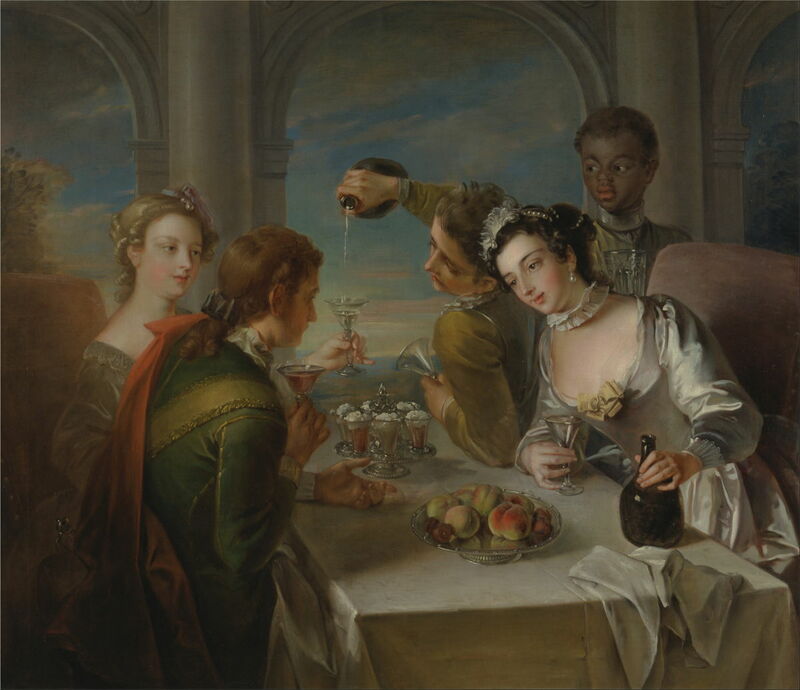 The last of my allegories is perhaps the closest to modern tastes: Philip Mercier’s The Sense of Taste (1744-47). Its two genteel young couples are enjoying healthier eating, with a bowl of fruit nearest the viewer. Behind that are half a dozen desserts topped with whipped cream, showing that even they can succumb to the temptation of calories. Although this is getting closer to appealing to my more modern palate, it still doesn’t really entice me to rush off for a quick snack. So I turn to still life paintings in the hope that they might be more successful. Food is an enormously popular item to include in a still life painting, but has tended to appear in abstruse combinations which are less attractive to the palate, like ‘lobster, drinking horn and glasses’ (an actual painting by Willem Kalf from about 1653). One of my favourite classical painters of still life, Clara Peeters can be relied upon to come up with brilliant depictions of more appetising combinations, such as her Mesa (Table) from about 1611. Even its birds have now been readied for the table, perhaps with more waiting under the crust of that fine-looking pie. 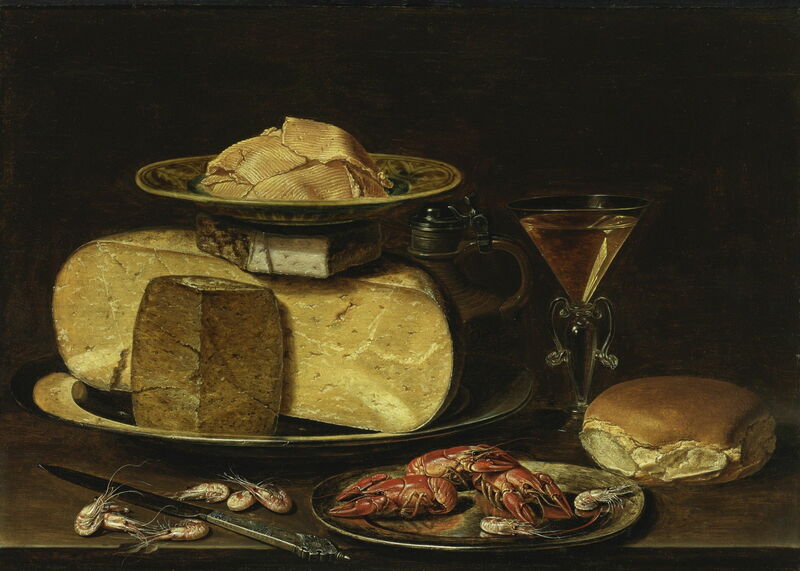 Clara Peeters’ marvellous Cheesestack with Knife, Shrimp, Crayfish, Glass of Wine and Bread (c 1625) shows not only her exceptional skill in composing and painting foods and the crockery and glassware in which they should be presented, but her taste in assembling them. William Merritt Chase (1849–1916), Still Life With Watermelon (1869), oil on canvas, 76.8 x 64.1 cm, Birmingham Museum of Art, Birmingham, AL. Wikimedia Commons. Generally considered the lowliest of the genres, still life paintings have been far more than just a painterly warming up exercise. At the start of his long and glorious career, William Merritt Chase rose to a vivid realism in his Still Life With Watermelon (1869) which even shows the subtle bloom on the grapes. His later virtuoso paintings of fresh fish became legendary among his students: brilliant, but not appetising, I’m afraid. 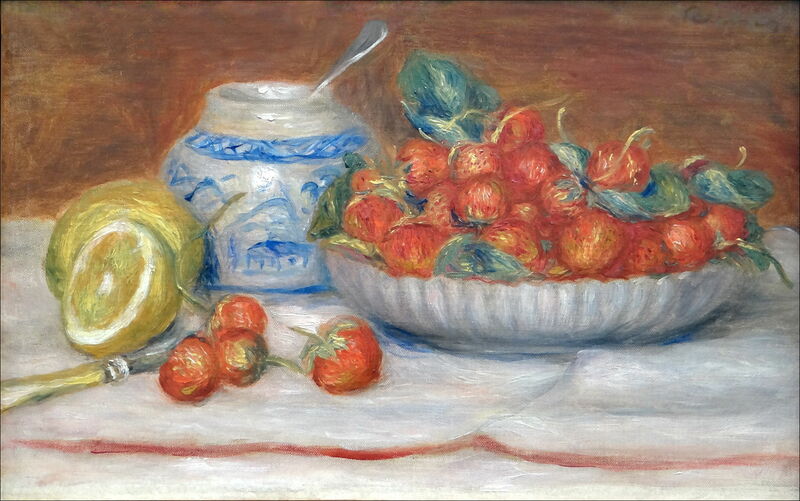 Pierre-Auguste Renoir (1841–1919), Strawberries (c 1905), oil on canvas, 28 x 46 cm, Musée de l’Orangerie, Paris. Wikimedia Commons. In search of a more sensory experience from an Impression, Renoir’s Strawberries (c 1905) certainly look the part, and are presented as carefully as are the dishes of Clara Peeters. But there’s still something missing. Diego Velázquez (1599-1660) (attr), Man With a Wine Glass (c 1630), oil on canvas, 76.2 x 63.5 cm, Toledo Museum of Art, Toledo, OH. Wikimedia Commons. 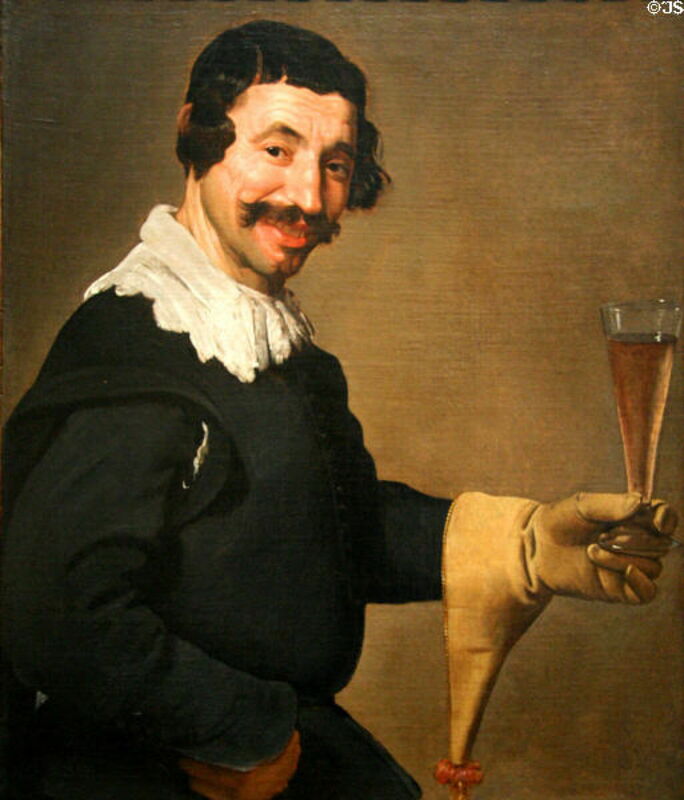 Perhaps it is the act of consumption, something formalised in Man With a Wine Glass (c 1630) which is attributed to Velázquez. Here I’m puzzled by that strange cream leather glove, and wonder if it used to be part of a sommelier’s outfit. Bartolomé Esteban Murillo (1617–1682), The Melon Eaters (c 1645-55), oil on canvas, 146 × 104 cm, Alte Pinakothek, Munich, Germany. Wikimedia Commons. 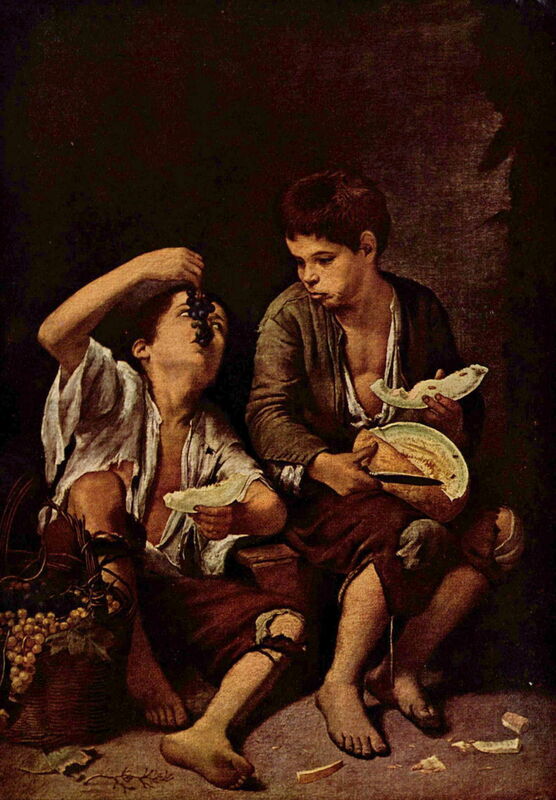 Murillo’s delightful painting of The Melon Eaters (c 1645-55) catches a couple of street urchins consuming grapes and melons which do look very appealing. Later this year I’ll be celebrating Murillo’s four hundredth anniversary – it is hard to believe that this work was created almost four centuries ago. 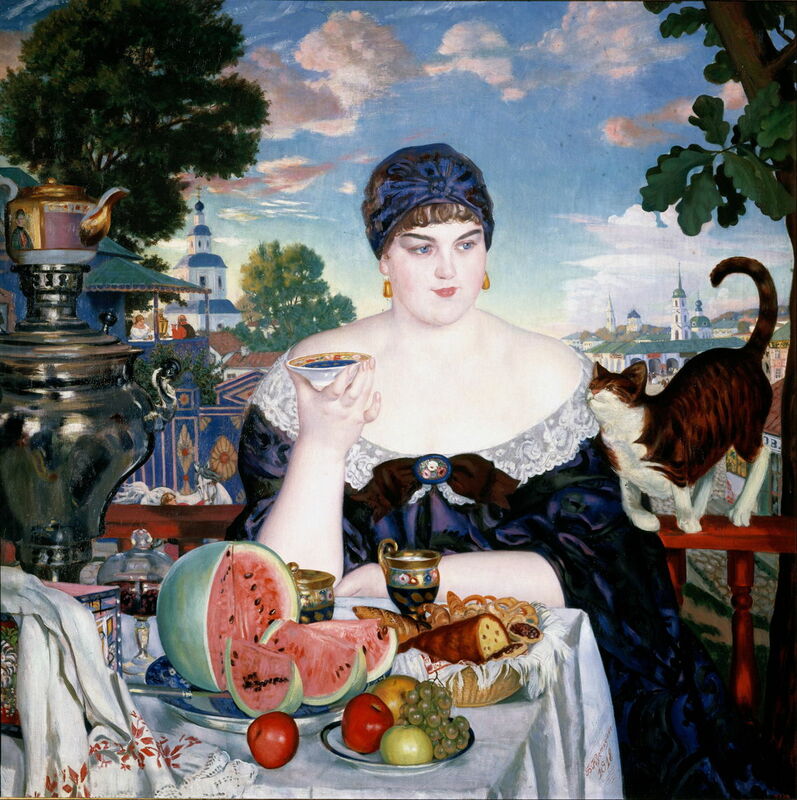 Joining Boris Kustodiev’s Merchant’s Wife at Tea (1918) looks even more real, and those slices of watermelon and cake look so tangible, but not quite tastable. 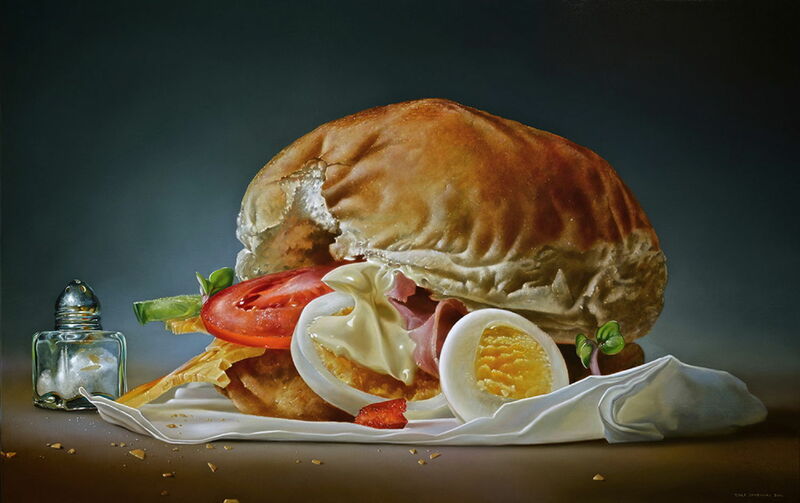 Tjalf Sparnaay (1954-), Sandwich Ham-Egg (2014), oil on canvas, 95 x 150 cm, location not known. Courtesy of the artist http://www.tjalfsparnaay.nl/, via Wikimedia Commons. Tjalf Sparnaay’s ‘mega-realistic’ Sandwich Ham-Egg (2014) takes this to its conclusion, where I think that I am finally convinced. It’s contemporary processed food: no eggshells, no ears of ripe wheat, not the slightest trace of an unsliced tomato, and certainly no adorable pigs. Maybe our real problem is that we no longer recognise food when we see it. Posted in General, Language, Life, Painting and tagged allegory, Bruegel, Brueghel, Chase, Janssens, Kustodiev, Mercier, Murillo, painting, Peeters, Renoir, Ribera, Rijckaert, Sparnaay, taste, Velázquez, Wouters. Bookmark the permalink. Interesting article. 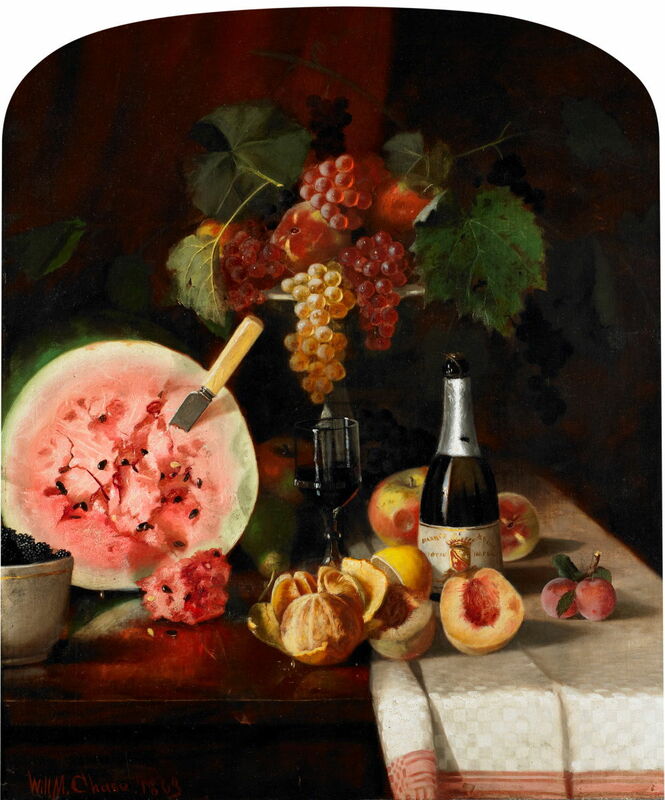 My wife paints still-life’s in oil, and for her next painting I will suggest to her to consider if she could sort of add a “taste and salivating-factor” and see whether this would somehow change the effect that her paintings have. Right now she often hears people who view her work commenting that they can almost reach for a piece of fruit or other object, and consciously and explicitly aiming for a salivating-factor might enhance that to viewers actually *wanting* to do so. Thank you: I wish her success. I am always reminded of that evil trick that you can play on a brass player: eat a juicy orange in front of them. They will salivate so much that they flood their instrument. I haven’t seen many paintings which might do that.